In the beginning… it all started one Sunday morning when Pastor Larry Millender and his wife Elaine came to preach at our church. I will never forget that Sunday April 21, 2013 for he prophesied over the people in our church and gave a word that God would bring new ideas, inventions, and ways to help His people become more prosperous and make money to give to the people who were in need in all manner. Many people are in need of Jesus and how He can help make their lives better whether it is a financial need, spiritual need, health need, or any area where God can bring improvement to their lives. The Word says in John 10:10…I am come that they might have life, and that they might have it more abundantly. 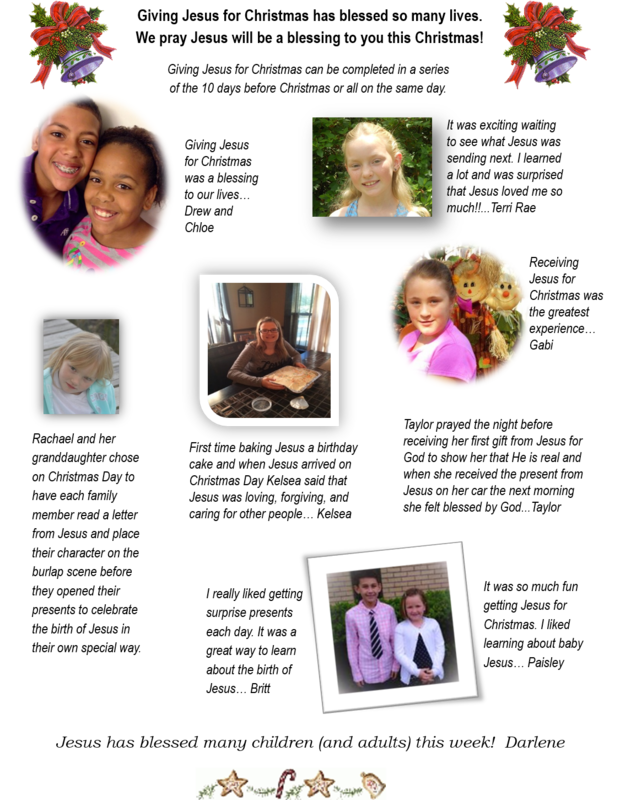 The sermon Pastor Larry preached became alive in my heart and I began over time to try different ideas, create different products to see if they were the products or methods where I could help people learn more about Jesus. After not having much success with those ideas I just quit trying to make things happen, I guess I just didn’t think that God could use me to help bring more people to Jesus and that the prophesy Pastor Larry preached was for someone else to accomplish. Then August 2012 came around and it was a normal everyday type of day and I woke up thinking about how Christmas was just right around the corner. It always starts around August the dread of Christmas and all of the human expectations Christmas brings. It’s amazing how much work goes into one day out of the year. Anyway just as usual the thoughts began about how I don’t really like all the stress and expectations that come with the whole Christmas season. As I was thinking I decided to stop being negative was going to pray about my attitude towards the Christmas expectations and ask God to give me a real meaning for Christmas. Oh, I know “Jesus is the Reason” we celebrate Christmas and those are nice words we say each year and sometimes I think people just say those words to be nice during the Christmas season when they are really overwhelmed by the stress they feel to perform or meet the expectations of the season. I love Jesus and the true meaning of Christmas and at this point in my life I somehow needed to have Jesus come alive in my heart on a new level that Christmas. I wanted more of a special way to enjoy Christmas. I began to pray each day for God to show me a way to really have meaning and joy throughout the Christmas season and not just time where we buy each other a bunch of presents, eat food, and just make it through day. Then one day in October after praying every day this same prayer every day I felt God was speaking to me and saying “Do you really want to know how to enjoy Christmas?” and I said “Of course that is the prayer I have been praying every day”. Then God spoke to my heart and said “When you give Jesus for Christmas you will have the best Christmas ever” and that was it! I said to myself “Well that is interesting how I do that”. I really at that moment didn’t have a clue what it meant. Give Jesus for Christmas how does one do that. So, I then began again to pray every day to ask God how to give Jesus for Christmas and then one day I started have some having some personal times with the Lord where He would wake me up and give me words to write and I would reach for my phone and type as fast as the words came because I thought if I didn’t they words would go away and I would lose them. Then other times I would find myself sitting on a bench and once again the words came to me or I would be driving and have to pull to the side of the road and type more of the words until I finally had the words for what would be called in the beginning letters from Jesus about being born on Christmas Day. Now at this point, I wondered what came next. How do I take the letters about Jesus being born on Christmas Day and give Jesus for Christmas? The Lord said here is what you do … you find some children who need Jesus for Christmas and you go to the store and by a manager scene and you will use the manager scene as gifts to give the children each day with the series of letters from Jesus to tell about the Christmas story. You see the letters and words God had given me were all about the Christmas story and Jesus coming for Christmas. 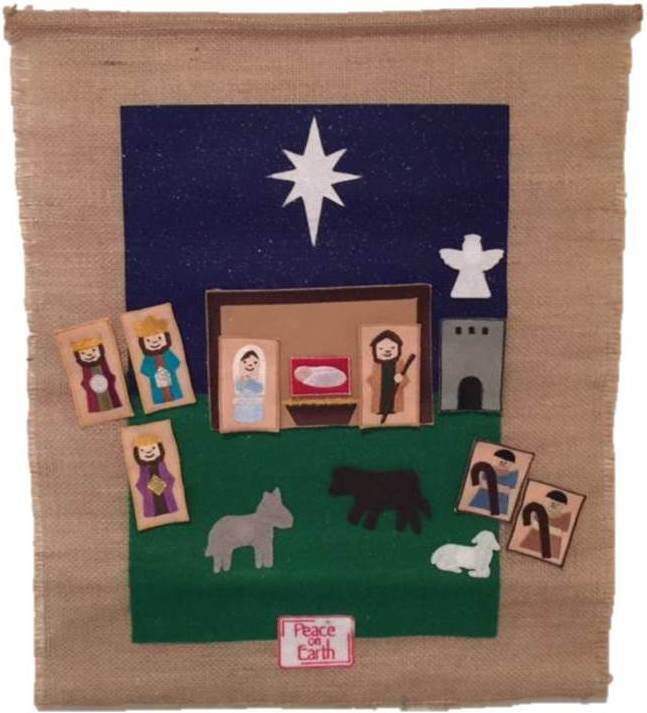 So, I went to the store and bought a manager scene and while traveling with a friend I told her the story about the letters and the manager scene as gifts of Giving Jesus for Christmas. And she loved the story so much that she said “Oh, I want my children to get Jesus for Christmas” and I told her that I had already picked out the children God wanted me to Give Jesus to for Christmas but if she wanted her kids to have Jesus for Christmas then I would just do it for them too. So off to the store to get the manager scenes and while traveling with a friend I told her the story about how God gave me the words for the letters and the manager scene as gifts of Giving Jesus for Christmas. Well, she loved the idea and immediately said “I want my children to get Jesus for Christmas”. I told her that I had already picked out the children God wanted me to Give Jesus to for Christmas but if she wanted her kids to have Jesus for Christmas then I would just do it for them too. That was no problem and I would just buy an extra manager scene and share Jesus with her children too. 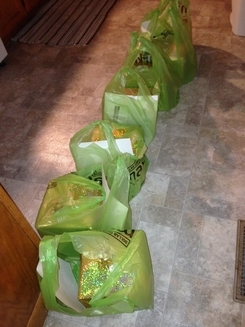 We went to Michael’s and bought the manager scenes and a few other items for the project. We then went and did some more shopping and while I was in one of the stores I got to thinking that if I gave her children Jesus for Christmas then I would need to give her brother’s children Jesus for Christmas and then if I gave them Jesus for Christmas then I would need to give Jesus to some of the children in our church. In an excited tone I said to my friend “we must go back to Michael’s and get more manager scenes because more children need Jesus for Christmas”. 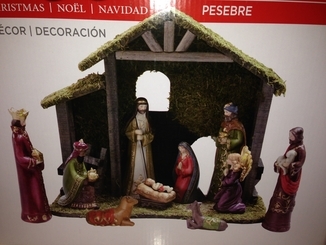 We went back and got more manager scenes and that first Christmas ended up with eight children getting Jesus for Christmas. I began on the December 16th, 10 days before Christmas and started the project delivery by dropping off a wrapped package and leaving the package and letter from Jesus on their doorstep at the child’s home. 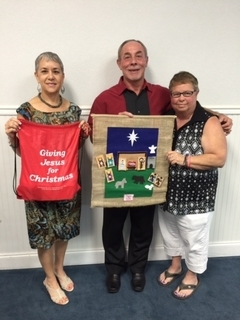 In the first package was a piece of burlap and a letter from Jesus about His coming birth. 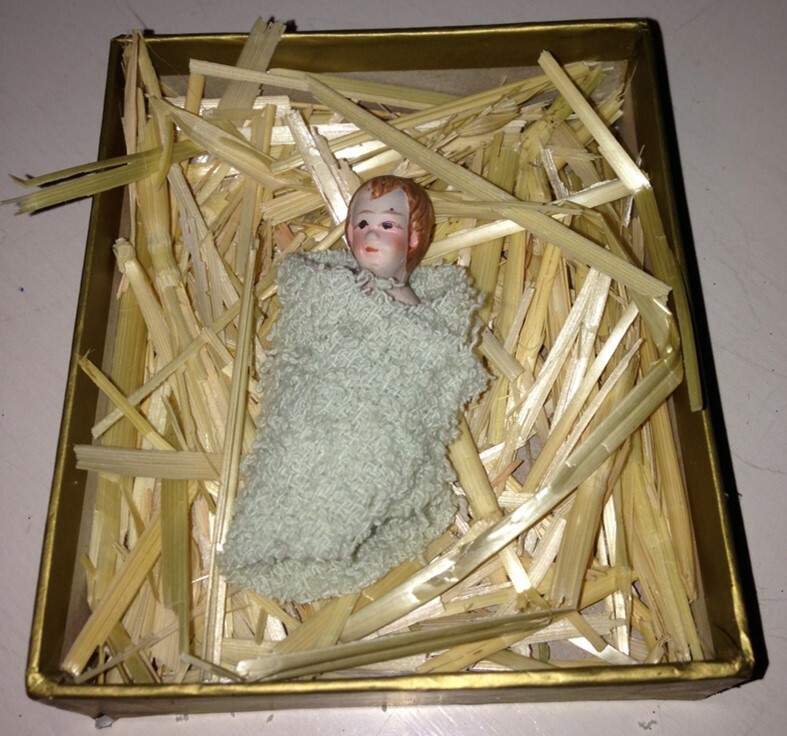 My first response the next morning was when I got to work and my friend’s brother said “you won’t believe what happened, last night someone left a box on the top of my daughter’s car and in it was a piece of burlap and a letter from Jesus”. I said what happened and he said “My daughter was so impressed when she opened it because she told him that just the night before she had prayed for God to show her He was real and then she received the box on her car the next morning from Jesus and she knew no one else could have known she had prayed that prayer”. I then began to tell him what I was doing and he was so blessed that he told me that whatever was needed he would help with as long as I kept bringing Jesus to his home because it blessed his family so much that day. Even his other daughter took the piece of burlap and letter from Jesus to school to show her friends. It was then that I knew for sure that Giving Jesus for Christmas was something special that would help bring Jesus to the lives of many children. 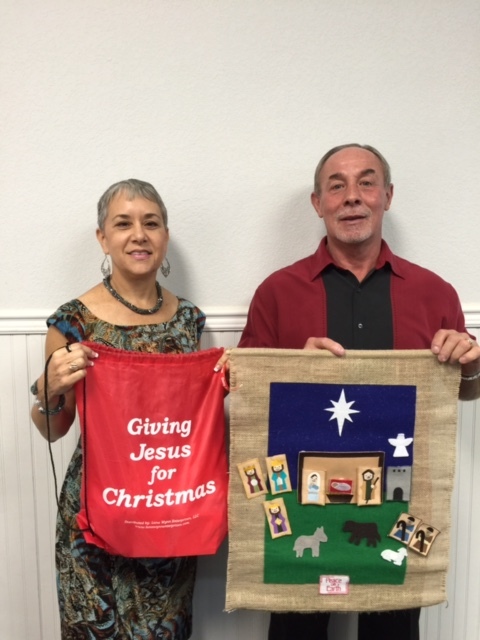 If the project brought that kind of blessing just on the first day with just a piece of burlap and a letter from Jesus then as the rest of the project unfolded Giving Jesus would bring great joy to all of the kids. And so it was each night I delivered another piece of the manager scene wrapped in a box with a letter from Jesus until on Christmas Eve all of the packages were delivered to complete the manager scene set. All of the children received Jesus as a gift on Christmas Day! It was a great and glorious day, God was right when He said “if you give Jesus for Christmas you will have the greatest Christmas ever.” I did have a wonderful Christmas that year and that first Christmas 2012. I learned how giving Jesus for Christmas was the most awesome experience and it gave me a new and very special meaning in my heart apart from all of the usual surface expectations that are put on that day. Many more stories have been collected with all the blessings Jesus was for all children that received throughout that Christmas season. 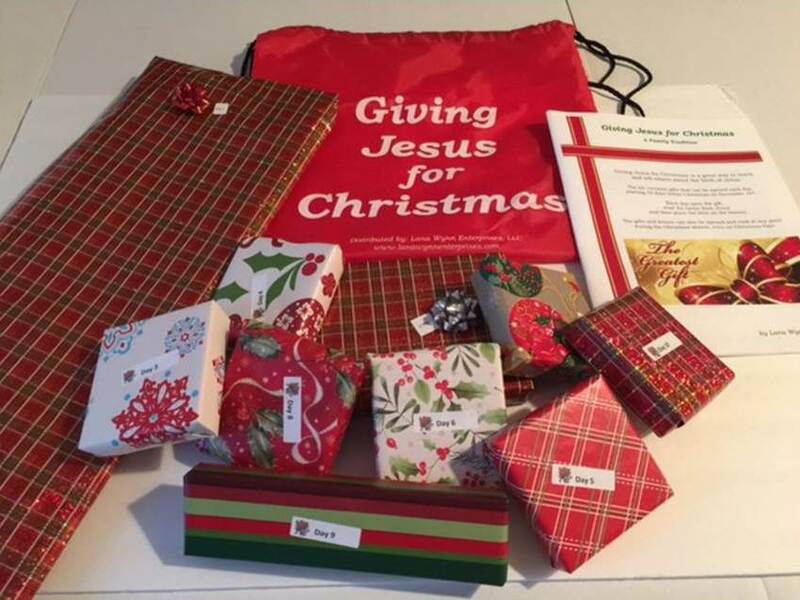 Over the last few years the project grew in new and exciting ways where I am able to give others and opportunity to help with Giving Jesus for Christmas by purchasing a kit for Christmas. The project developed to where now I have put all the letters in a book and made different characters for the kit so the children can open a present each day beginning 10 days before Christmas and open Jesus for Christmas. All of the characters are embroidered and the animals are cut out on the cutting machine and the kit comes with a book and all of the presents wrapped. The manager scene will be presented to the children in a new and special way as they unwrap the package and place the item on the banner each day. In a way without even knowing it, the prophesy is being fulfilled each time a kit is sold. I didn’t know from the beginning that this would turn out this way and that Giving Jesus for Christmas would be more than just a time where I felt a special place in my heart towards the birth of Christ but also can give others the opportunity to have that same feeling where Christmas comes alive to them with Jesus coming on Christmas Day. That’s how Giving Jesus for Christmas was born and my prayer is that You Give Jesus for Christmas in whatever way God speaks to you and that You have the best Christmas ever!